The Journey Through Hallowed Ground Partnership will host a Living Legacy Tree Planting Project ceremony on Sunday, June 29 at 2:30 p.m., at Oatlands Historic House and Gardens in Leesburg, Va., to commemorate the 150th anniversary of the American Civil War. Through the Living Legacy Tree Planting Project, one tree will be planted for each of the 620,000 soldiers who died during one of the most defining moments in American history. Upon completion, the Living Legacy Project will create the first 180-mile landscaped allee in the world and the only allee dedicated to memorializing the American Civil War. For more information on the project itself visit: http://www.hallowedground.org/Get-Involved/Plant-a-Tree/About-Living-Legacy . The Rising Sun™ Redbud PP21451, discovered by breeder Ray Jackson of Belvidere, Tennessee, is a Great New Plant™ from the Garden Debut® plant collection that features brilliant, golden tangerine colored new growth and lime green, heart-shaped foliage all summer with no burning, even in full sun, and dark lavender blooms appear before the foliage in early spring. This vigorous grower reaches 8 to 12 feet tall with an equal spread. It will make a striking addition to the Living Legacy Project allee for visitors to enjoy for years to come. Contact Greenleaf Nursery Company for an availability of Great New Plants™ and Trusted Selections™ from the Garden Debut® plant collection. 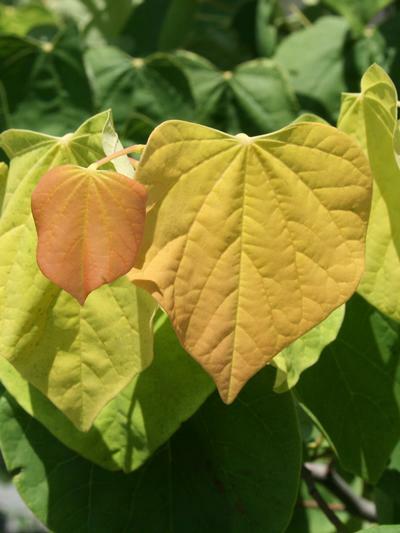 For more information about The Rising Sun™ Redbud PP21451 visit www.gardendebut.com or check us out on Facebook at https://www.facebook.com/GardenDebut . Garden Debut® is managed by well-known Greenleaf Nursery Company. Greenleaf has a sterling reputation of environmental stewardship for 55 years and is renowned for producing and distributing outstanding plants (14+ million plants annually) from exemplary production fields (nearly 2,000 acres in Oklahoma, Texas and North Carolina).